The AFI group of companies has further strengthened its UK coverage by opening a flagship depot on a 2.2 acre site in Birmingham. 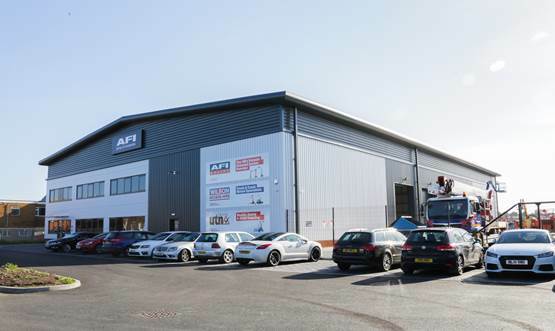 One of the UK's leading powered access specialists, AFI group of companies has further strengthened its UK coverage by opening a flagship depot on a 2.2 acre site in Birmingham. The new purpose-built depot which will be AFI’s largest depot in size, features hire offices, training facilities, a large workshop, a fully floodlit yard and dedicated cleaning area for over 300 machines in the depot’s fleet. AFI’s local team in Birmingham is on hand to advise customers on high quality powered access machine hire, sales and training. They support their customers on every step of a hire, from site surveys, placing an order, keeping customers updated on delivery through to off-hire and collection. AFI’s customers in Birmingham and the surrounding geographical area will be serviced here. 15,000 sq ft of workshop space is home to the depot’s engineering team, they carry out pre-delivery inspections (PDIs), services, LOLER inspections, repairs and manufacturer updates on a growing fleet of rental machines. UTN Training (part of the AFI group of companies) has also moved to this site, bringing the hire and training facilities into one location. They offer a variety of training courses run from the new facility including IPAF, PASMA, IOSH, NEBOSH, New Roads and Street Works (NRSWA) courses, as well as other Health & Safety related courses. In recent years AFI has made significant investments in facilities, hire fleet, and people. They have expanded to 30 locations in the UK, and five in the Middle East. They now have a fleet of more than 7,000 powered access machines and provide training for more than 25,000 people each year.